This was a trip for work and also to gather up and ship off the (hefty) remainder of Seb’s stuff in London; I hardly had any time to really enjoy London, which was frustrating and made for an exhausting trip, wedged as it was between very busy days of work in France – I didn’t take any time off for this, and the journey from Montpellier to London and back is quite a long one. I wish I’d at least been able to see you, Melissa, but that shall have to wait for another, less hectic (and last-minute!) stay. I did manage to go to Loop in the evening, though! 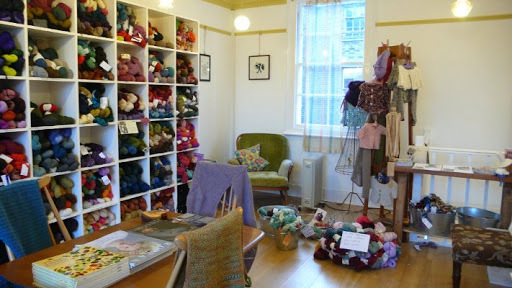 Twice – the first time I felt too overwhelmed by the abundance of goodness to make any purchase, so I went back just before closing time the next day with decisions taken on what yarn and book to get 🙂 This place was an absolute delight! The scarf, “Beginner Scarflette”, is a pattern that was published on Ravelry at the exact same time I was learning how to knit and looking for a beginner’s pattern – talk about serendipity! It is perfect to practice stitches as it is a sampler of the main knitting stitches. I knit it in a yummy Rowan yarn, Colourscape, a collection whose colourways were designed by Kaffe Kasset. Have a great weekend, everyone. Bon week-end à tou-te-s ! Beautiful pictures Isabelle! 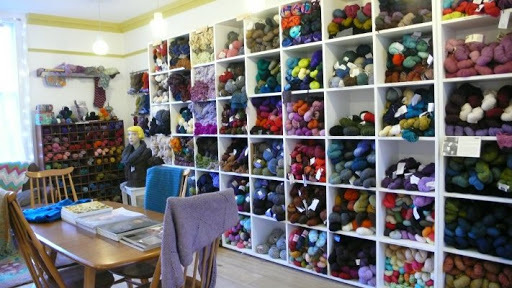 I am so glad you love to knit, just think you just opened a whole another world of patterns. I look forward to your new projects. What a beautiful first knit, Isabelle! Beautiful pictures too. Its lovely to see sewing, knitting and crochet put together so perfectly in one outfit. Such a pretty outfit, I love all the pieces, especially the coat. 🙂 I can't believe it's your first knitting project. I love your scarf – perfect for a first knitting project. I'm a new knitter myself and am really enjoying it. What a pretty scarf. It looks like you did have a few moments of enjoyment amongst all the hustle and bustle of the trip. Merci pour ces jolies photos, Isabelle. Ton écharpe est très belle et va vraiment très bien avec ton superbe manteau. Quel talent! Isabelle you did a wonderful job with my pattern. You are on your way now! I am going to send you my new pattern “Loopy Snecklace”. Look for it coming your way on Ravelry!